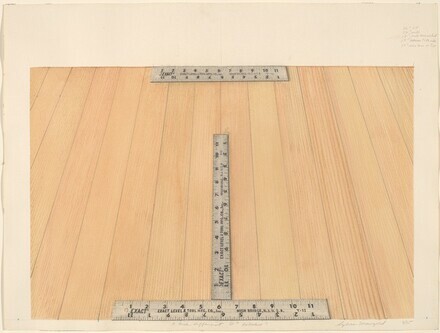 lower center in graphite: "Three different 12" Rulers"; lower right in graphite: Sylvia Mangold 4/75; upper right in graphite: 36" VP> / 12" rule / 12" rule diminished / 12" between T + B rule / 12" rule dim. on Top. Painting, Drawing and Sculpture of the '60s and the '70s from the Dorothy and Herbert Vogel Collection, Institute of Contemporary Art, University of Pennsylvania, Philadelphia, 1975: p. 14.